Contains: Heavy duty cutter handle, No. 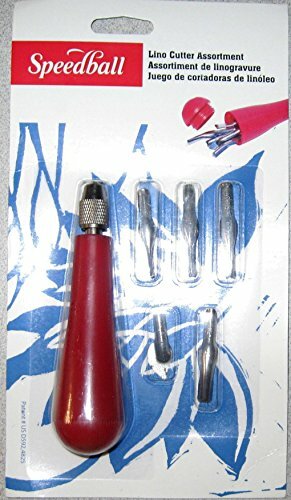 1 V shaped fine line cutter, No. 2 V shaped medium line cutter, No. 3 shaped wide cutter, No. 5 U shaped large gouge and No. 6 knife. All blades made from tempered steel. Featuring a new twist-off end cap for easy cutter storage in handle, these durable hard plastic lino handles are designed to a higher standard. With a chrome plated secure chuck system, these handles make it easy to install and change cutters. Hand ground, buffed and honed, the lino cutters are sharpened on the outside for optimal cutting precision. Made of high quality steel, they are ideal for cutting both soft and hard surfaces. Current color in stock is Dark Pink/Red! Price is for one set as described! Other styles available, please see our listings!